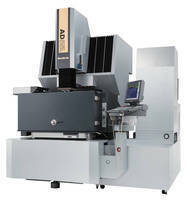 Schaumburg, IL – Sodick will be showing the all new AD55L Sinker EDM machine at Houstex in PD Browne South’s booth 539. Come see the AD55L Rigid Linear Motor Driven Sinker EDM machine at Houstex February 24-26, 2015. The AD55L is a high-performance machine that features no-flush technology, a user-friendly control and zero-electrode wear technology combined with increased machining speed. Sodick’s latest EDM technology advancements will ensure higher manufacturing efficiency, drastic cost reduction and shortened delivery time. The machine uses a full-frame, floor-standing bed design. Heavily ribbed, high-strength Meehanite castings are used for the bed, table and column construction. The rigid construction ensures long-lasting accuracy. The AD55L has an X, Y, Z travel of 23.62” x 15.75” x 15.75” (600 x 400 x 400 mm) and can accommodate a workpiece weight of up to 2,204 lb (1,000 kg). The machine comes with a 10-Year Positioning Accuracy Guarantee on its Rigid Linear Motor Drives.